A Sonoma State University collaboration with the city of Santa Rosa is proving that with just a little help from Mother Nature, cars can run on algae--giving a whole new meaning to green energy. As part of the wastewater treatment process at the city's sewer plant, ponds covered with aquatic plants are being used to help clean toxins and pollutants like nitrates out of the water. Then, the plants are harvested to create renewable energy that charges electric cars. First, wastewater is run through channels that contain water-purifying aquatic plants. These plants thrive on the toxins found in untreated water. In many areas of California, this water contains a high level of nitrates due to fertilizers found in agriculture runoff. Nitrate compounds at these levels can be harmful to humans. In fact, if ingested, nitrate-rich water can interfere with the ability of red blood cells to transport oxygen. 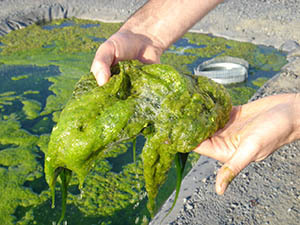 Luckily, algae and other aquatic plants use nitrates as a form of food. As they absorb it, the water becomes cleaner--and the plants grow stronger as they store energy. The next phase utilizes that energy. When combined with a few other ingredients, the harvested plant matter, also known as biomass, turns into energy-rich biogas. The biomass is combined with dairy manure, leftover glycerol from a local biofuel plant, and wine lees, sediment formed during the fermentation stage of the wine-making process. When added to a silo-like tank, this mixture creates biogas: methane and carbon dioxide. The biogas is sent to a generator that powers an electric car charging-station. Because not all of the biomass turns into gas, the final phase makes use of the leftover solids as compost for local crops. Thanks to this project, the city is cleaning water, powering cars and composting produce, all using little to no energy. "The city is now an innovator in sustainability, which draws attention to this research, leading to better practices in the future," said Caden Hare, who now directs the project he helped initiate as a Sonoma State student in 2005. "It's incredible to see something that we started in the lab get to this level." Hare and his mentor, Sonoma State biology professor Mike Cohen, developed the the idea behind the project, known as Fuel from Aquatic Biomass (FAB). He helped it gain momentum with grant funding from numerous agencies, which also funded educational materials like this comic book. Most people probably aren't aware that wetlands can fulfill the functions of traditional water treatment plants, using almost no energy. Or the fact that aquatic plants, normally considered a nuisance, have such promising capabilities. Cohen says it's important we gain a greater insight into these practices, because knowing about the environment contributes to a more sustainable future for everyone. "The interconnected biological processes in the FAB system are quite complex," Cohen said. "It's critical that we effectively communicate research that has so much promise. Breaking down the project to a comic book, for example, makes the research much more accessible." And Hare says people are starting to get the big picture. "Now that people are beginning to weigh in on the environmental costs and benefits of creating energy and treating water, it creates practices that are truly sustainable and within our reach," Hare said. Aside from the obvious--saving money, energy, and the environment--Hare says the most satisfying part of the project is the partnership between the university and the city. "It's been great to work with both the city and Sonoma State," Hare said. "The research is setting up a platform for a more sustainable energy solution for this community, and potentially others." Visit http://youtu.be/DlUSzlKR1lQ to see a video about the process. (Rohnert Park) – Building on the work of many who helped make the university a leader in sustainability, Sonoma State next month will commit itself to meeting the highest of standards for sustainability and resilience among universities nationwide. Thanks to a dedicated student's multi-year effort, Sonoma State University will install a 5,300-gallon greywater system this fall to irrigate a student garden that currently supplies over 1,000 pounds of fresh produce each year to a local food bank.